Want to jumpstart your mind and body each morning with nothing but the finest ingredients? What if you could do exactly that for less than a glass of tea or cup of coffee? Well, say hello to Kyani Sunrise! 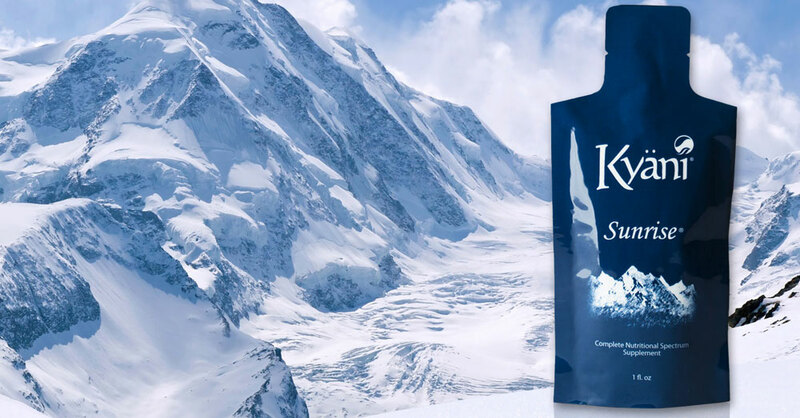 Kyani Sunrise is nutritional powerhouse designed to provide you with nothing but the very best all-natural ingredients proven to invigorate both the body and mind. It’s loaded with essential vitamins, minerals, taurine, Inositol, L-Theanine, and 11 powerful antioxidants to supercharge your health. If you want to get the most out of your body and maximize your daily potential, Kyani Sunrise is the solution. At least, that’s what users claim. Let’s delve deeper into this antioxidant-rich super supplement to see exactly what it is and what it can do. Kyani Sunrise – What Is It? A lot of us rely upon coffee or green tea to get our mind and body moving each morning. While the stimulating nature of these breakfast time staples certainly work, there’s a much healthier and more effective option – Kyani Sunrise. It’s an easy, all-natural way to rejuvenate the body and invigorate the mind.A nutritional powerhouse, Kyani Sunrise is an innovative, carefully formulated blend of powerfully effective vitamins, minerals, antioxidants, and superfoods proven to help strengthen the body’s systems and fuel them throughout the day. When combined, they form a nutritional powerhouse of premium-quality ingredients, all of which have been rigorously tested for efficacy. Just one serving a day helps support the immune system, brain function, digestion, and heart and cellular health. Like coffee or tea, it also boosts energy levels to stimulate the mind and get it ready for the day. At least, that’s what Kyani and its thousands of users say. After putting it to the test, we wholeheartedly agree. The real power of Kyani Sunrise, however, lies in its powerful antioxidant properties. In fact, a single serving of this super supplement provides FIVE times the antioxidant protection of any other supplement on the market. 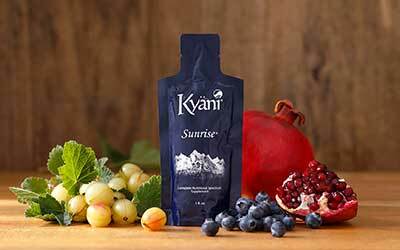 What Makes Kyani Sunrise Such an Antioxidant Powerhouse? Vitamin B-1: Helps support the nervous system, heart, and free radical detoxification. Vitamin B-2: Helps promote blood cell health, cellular energy, eye health, skin elasticity, and healthy hormone levels. Vitamin B-3: Helps support the digestive system, nervous system, hormone production, and blood cells. Vitamin B-5: Helps promote the healthy function of red blood cells, adrenal glands, and neurotransmitters. It also helps reduce stress levels. Vitamin B-6: Helps support healthy circulation as well as muscle, nerve, and immune function. Vitamin B-9: Helps promote healthy DNA and RNA production as well as immune system, gum, red blood cell, and GI tract health. Vitamin C: Helps minimize free radical damage and promote immune system, skin, gum, and eye health. Vitamin D: Helps support skin, nail, and hair health. L-Theanine: Commonly referred to as L-glutamine, this amino acid is a powerful antioxidant proven to promote immune system health and healthy blood circulation. It also helps manage stress levels for better overall physical and mental health. Taurine: An amino acid that supports the cardiovascular system, nervous system, and muscle function. Inositol: A natural chemical compound found in phosphates and food and plant lipids. It supports cellular growth, healthy DNA production, fat metabolism, and nerve transmissions. Trace Minerals: Support the production of protein and energy. Also help maintain healthy insulin and pH levels. Not only does Kyani Sunrise offer a healthy blend of 20 vitamins and minerals per serving, but it also features a ton of superfoods like wild Alaskan blueberries, wolfberries, and more. Several studies have determined these berries and the other superfoods in Kyani Sunrise provide a wide-range of impressive health benefits. This is largely due to their rich antioxidant content.Let’s have a closer look at these and the other superfoods found in Kyani Sunrise to get a better understanding of why they’re included and exactly what they can do. Wild Alaksan Blueberries – Grown in the wilds of Alaska, these blueberries have a high concentration of resveratrol, which is an antioxidant proven to boost both cardiovascular and mental performance. Blueberries in general are high in antioxidants, but wild Alaskan blueberries deliver twice as much antioxidant power than blueberries grown anywhere else in the world. In fact, according to some reports, blueberries grown in the harsh Alaskan climate can have as much as 1000 percent richer in antioxidants than blue berries cultivated on farms. Concord and Noni Grapes – These grape varieties encourage nitric Oxide production, helping to increase endurance and promote healthy circulation by dilating the blood vessels. Grape Seeds and Skins – Similar to the skins of blueberries, grape seeds and skins contain resveratrol, a natural compound that’s powerfully effective at lowering bad cholesterol levels, lowering blood pressure, improving the healing of wounds, and boosting antioxidant activities. Plus, grape seeds and skins are a great source of fiber too. Wolfberries – Also known as Goji berries, these great tasting berries are packed full of potent anti-aging nutrients that promote eye, kidney, and liver health. Wolfberries also help lower the body’s blood sugar levels, decrease blood pressure, reduce lipids, and improve the immune system. Cranberries – Grown in water, these berries are well-known to promote urinary tract health and boost mental performance. Pomegranates – Proven to promote healthy blood circulation and lower bad cholesterol levels. Red Raspberries – Reduce inflammation and helps to effectively manage pain. Aloe Vera – Promotes GI tract and immune system health. Helps heal sunburn too. Just kidding. Bee Pollen – Boosts energy levels and helps provide seasonal allergy relief. If you want to take charge of each day and set your body up for success, Kyani Sunrise may be the solution you’ve been looking for. Its powerful blend of antioxidant rich vitamins and minerals support whole body health, boost energy levels, and provide an invigorating way of starting each day.